Each day, during the buildup to Christmas and the holidays, I am going to feature one special item that I believe will make a great gift for you or one of your friends and/or family members. Today’s special item is this gorgeous metallic-hued pompom hat from Jocelyn. It comes in gold (featured), silver, and black and boasts a dyed fox fur pompom beanie. I love its shiny exterior and the fluff of the furry pompom. 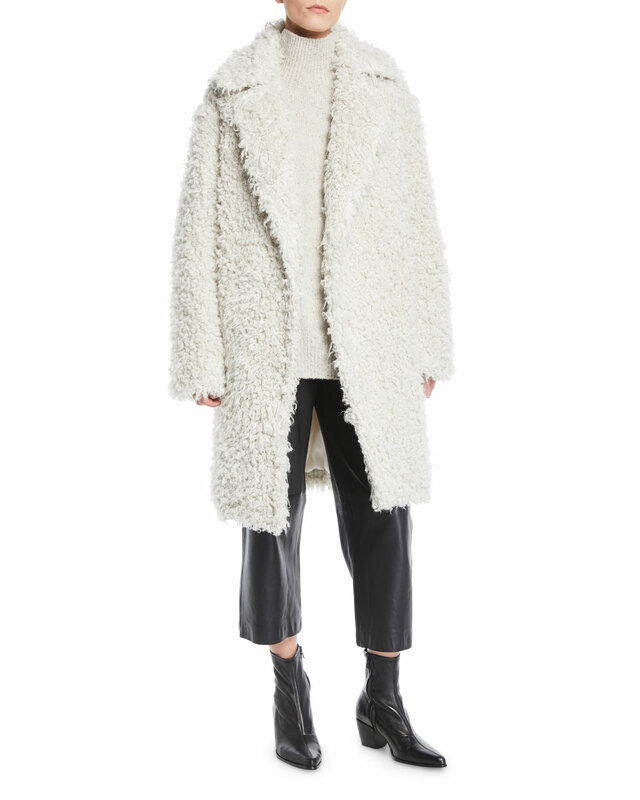 This year, winter coats positively celebrate and elevate faux fur. I would argue, in fact, that with all the gorgeous faux options, there is absolutely no reason to pay for and wear the real deal. 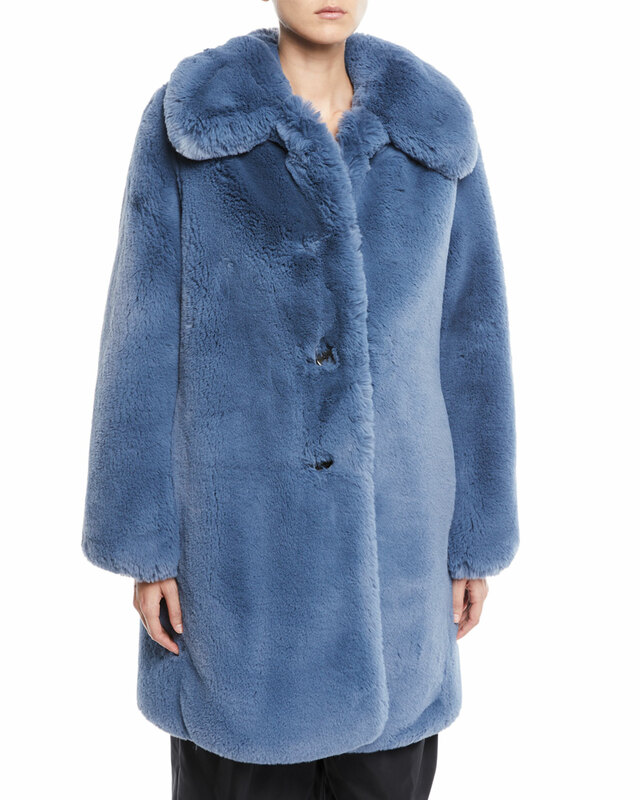 Faux fur has really come into its own. Not only does it look great, it also feels so soft and cocooning that wearing it is akin to being hugged by the most downy of teddy bears. Now, I’m not gonna lie. Some faux fur coats are of a much better quality than others. 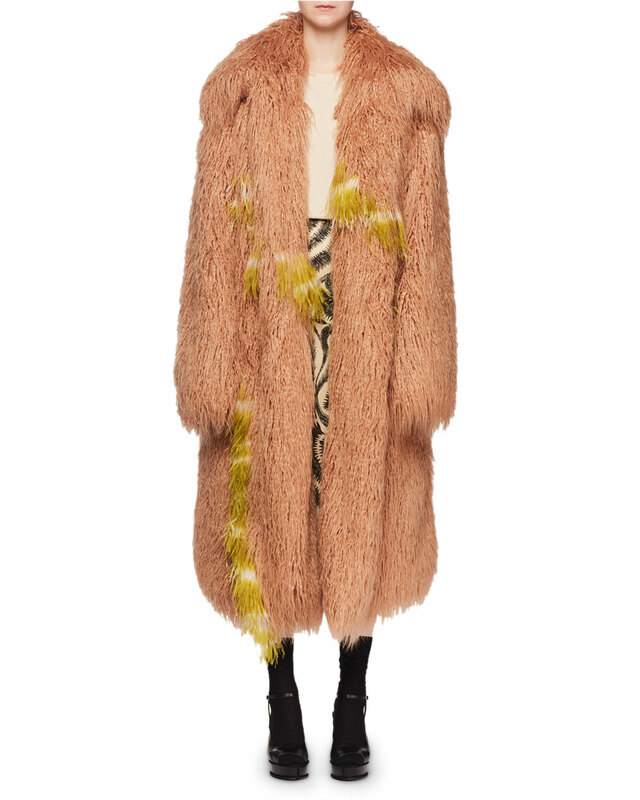 A brand like Shrimps offers the finest of faux fur. Thick, shiny, ultra soft, such a high-end faux fur looks divine, keeps you warm, doesn’t get matted, and will last a long time. Cheaper faux cuts, say those at Target, are not as sumptuous and shiny and likely will only make it through one to two seasons before you are going to want to chuck em in the Goodwill bag or, worse, the garbage can. 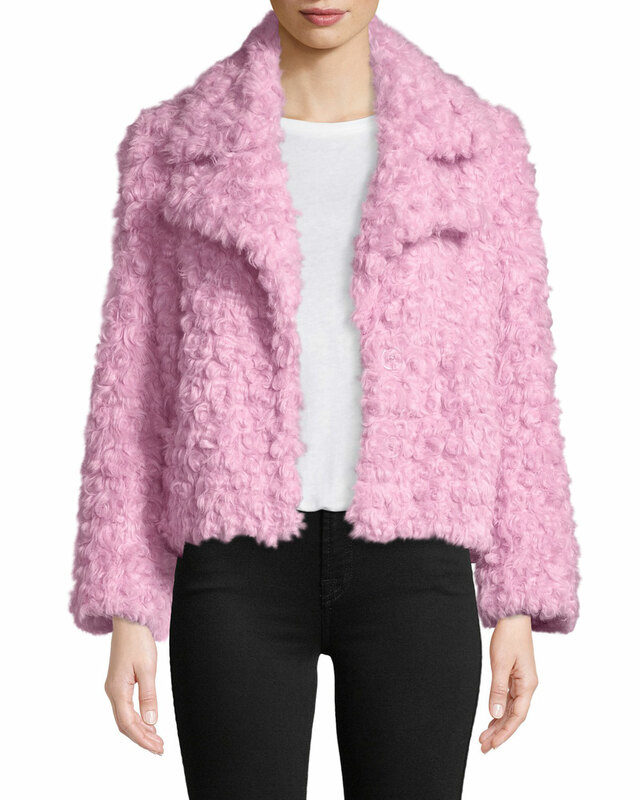 If you don’t already own a faux fur, it’s time to make the commitment. A few things to keep in mind as you begin your shopping. 1. If you have blond hair, go for darker faux furs. And vice versa, if you have dark hair, consider lighter hues. The contrast is more visually appealing. 2. Also, don’t be afraid to embrace some of the richer, more saturated colors out there…say emerald green, sapphire blue, spotted leopard, and ruby red. Because they are not too pricey, you can afford to be more bold, make more of an entrance, and command more of the room, yes? 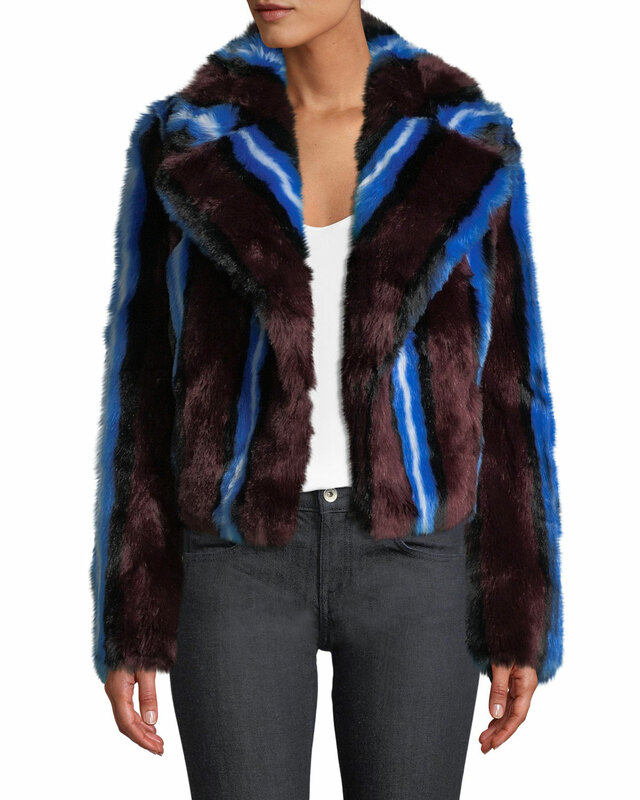 Check out my curated collection of faux fur coats, which features both high-end options and more affordable versions. Also check out French Connection, Mango, Zara, and H&M. All have similar styles in different pricepoints. 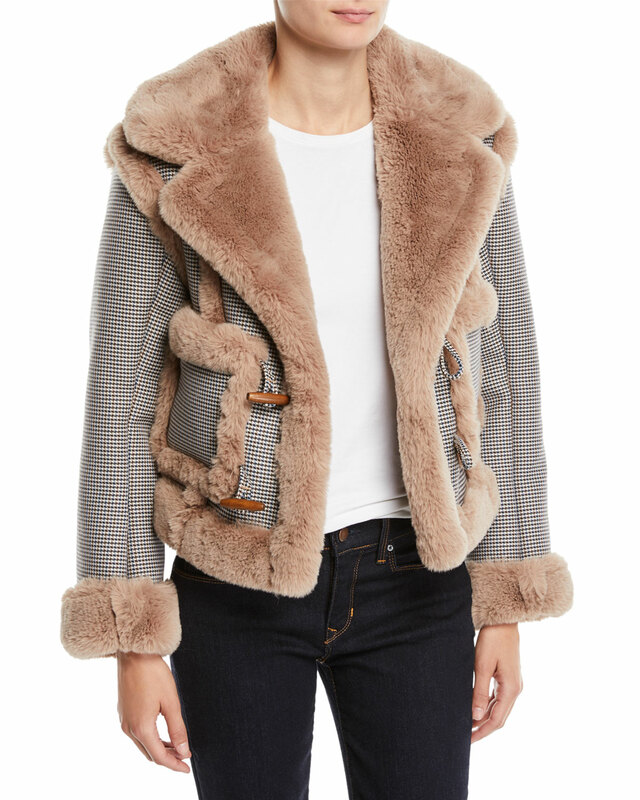 Featured Image: Zara Double-Breasted Faux Fur Coat. $169.00. http://www.zara.com. 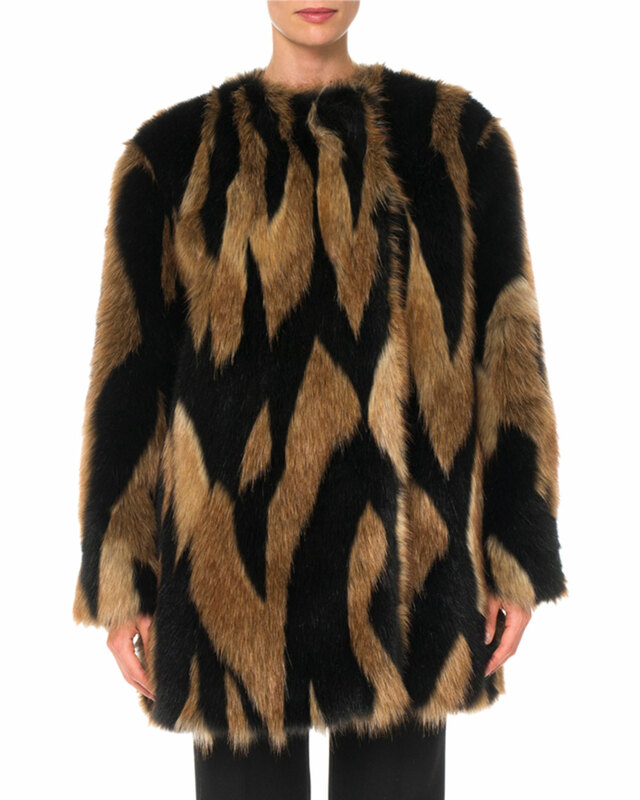 Below: Fabulous Furs Faux Fur Tiered Swing Coat. $299.00. http://www.neimanmarcus.com. 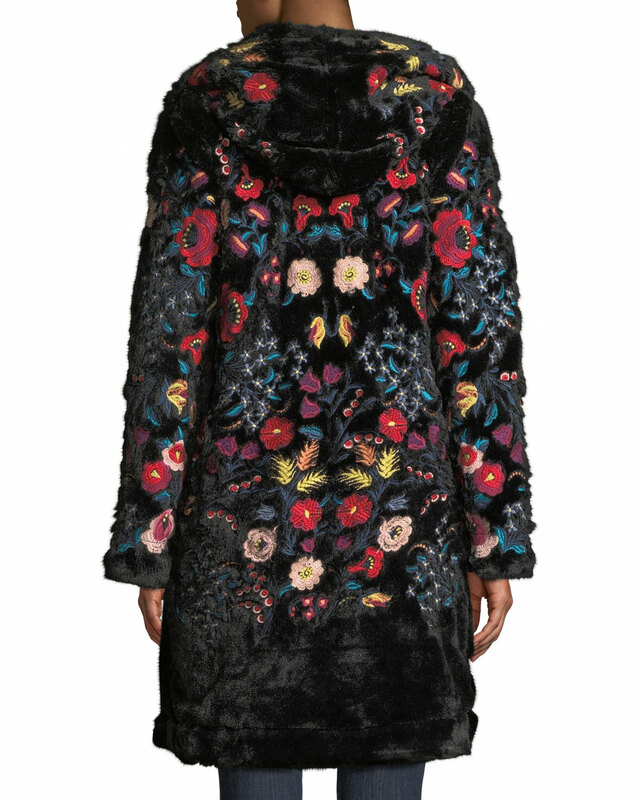 Johnny Was Gena Embroidered Faux-Fur Coat with Hood. $495.00. http://www.neimanmarcus.com. 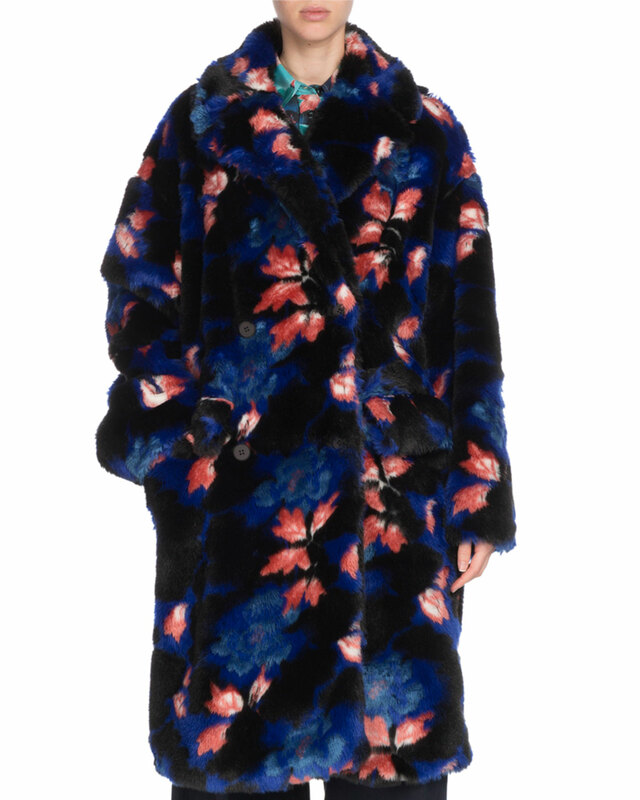 Kenzo Oversized Floral-Print Faux-Fur Coat. $830.00. http://www.neimanmarcus.com. 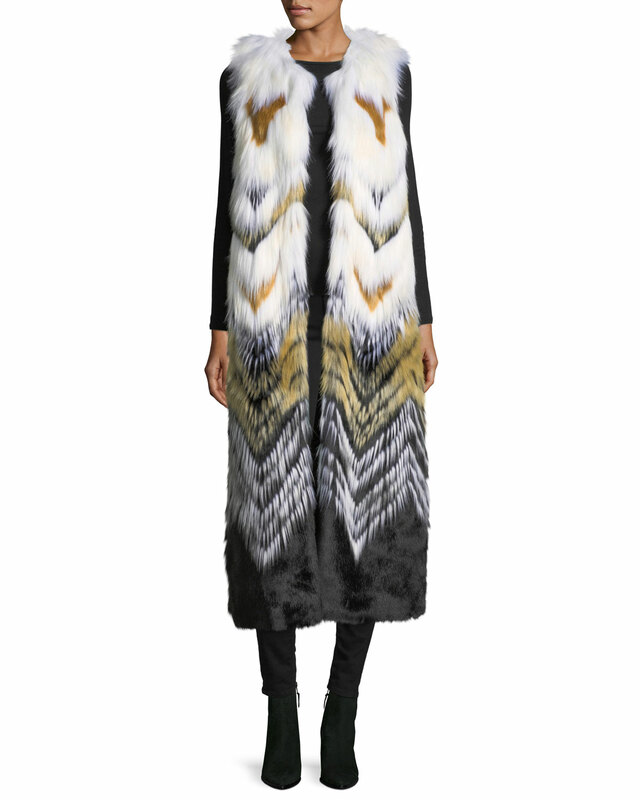 Givenchy Intarsia Faux-Fur Quilted-Lining Mid-Thigh Coat. $3,490.00. http://www.neiman.marcus.com. 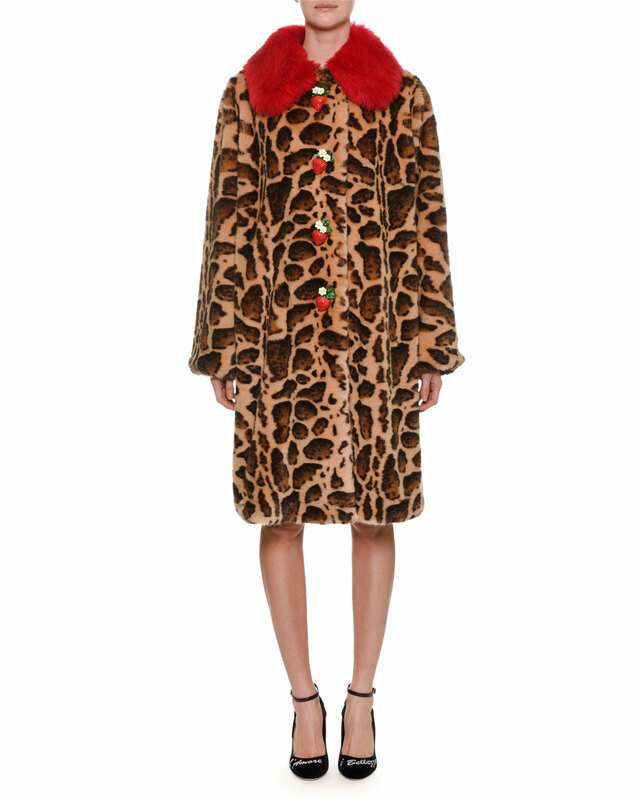 Dolce & Gabbana Strawberry-Buttons Leopard-Print Faux-Fur Mid-Calf Coat. $3,495.00. 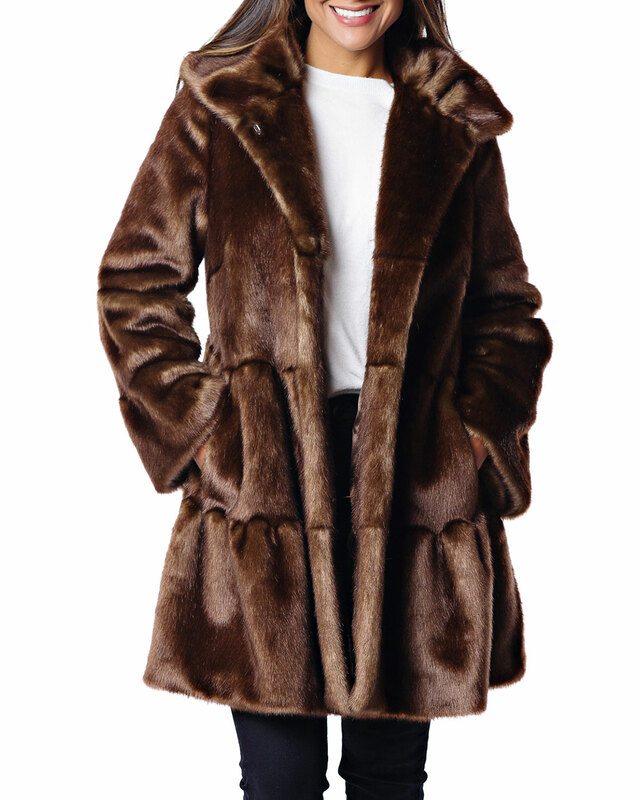 Vince Shaggy Open-Front Long Coat. $695.00. Opening Ceremony Insomniac Reversible Faux-Fur Houndstooth Jacket. $625.00. As I was working out the other day, I noticed how the younger women in my group training session had beautiful, unblemished arms and decolletage. (After so many years of chasing a bronzed body via the sun, I am left with mottled arms and a decolletage sprinkled with freckles and other sun damage.) I realized in that moment that not only do we need to take assiduous care of the skin on our face, we should also protect the rest of our body each and every day. My new regime includes using this SunBum SPF 70 on my arms, top of ears, neck, legs, hands,…basically anywhere the sun’s rays can reach my skin. On top of that, I put my self-bronzing lotion by Vita Liberata. The sunscreen, which leaves a slightly white hue, acts like a primer, covering up some of the damage. The bronzer gives me the glow that I got from the sun for so many years. The best part is the coconut scent that lightly lingers on my skin. People keep telling me how good I smell. Love that! I wish I would have started this regime years ago. It’s the best way to keep the skin on your body healthy,young-looking, and, hopefully, cancer-free. If you only protect your face, you are providing a huge disconnect between that skin and that of your neck and arms and the rest. I have a confession…I love leather. When the leaves turn and the temps begin to drop, nothing feels more appropriate than a supple pair of leather leggings or leather pants. And, this season, they are turning up in styles that go well beyond the basic legging. I have spotted them in a very flirty crop flare trouser style–cing a sept and UNRAVEL–thank you very much! This style looks particularly fetching with a strappy heel, an embellished bootie, or, for a more casual vibe, a white trainer–white T-shirt, black blazer a la Balmain–so chic. The other leather look I’m digging is the motor cross style from Spanx, which has the added benefit of sucking everything in and being ultra comfortable. Now, if you are against actual leather, fear not. There are tons of great faux versions, which, generally speaking, will cost you a lot less. The benefit of faux is that the material will not stretch out and lose its shape the way leather can over time. The downside is that faux leather tends not to breathe all that well, so you may feel a tad sweaty wearing them. I’m not talking about sweat coming out in buckets–gross!–rather a bit of dewy sweat a la Scarlett in Gone with the Wind. Leather and faux leather leggings/pants should really be a staple in every stylish chick’s wardrobe regardless of age. So if you can splurge, go for a really good pair. You will find yourself wearing them over and over and for years to come. 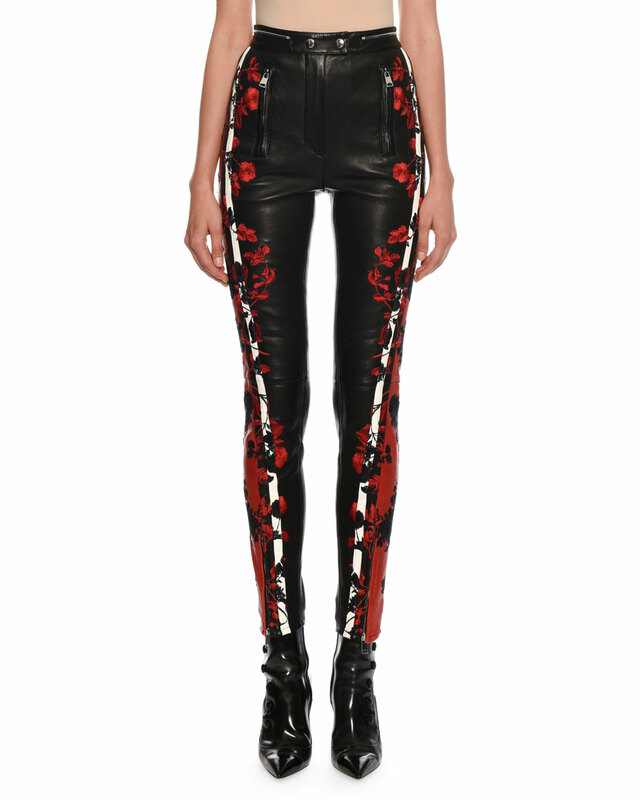 Here is a curated collection of this year’s best leather trousers and leggings. cinq a sept Marcelle Cropped Flare Pant. $895. 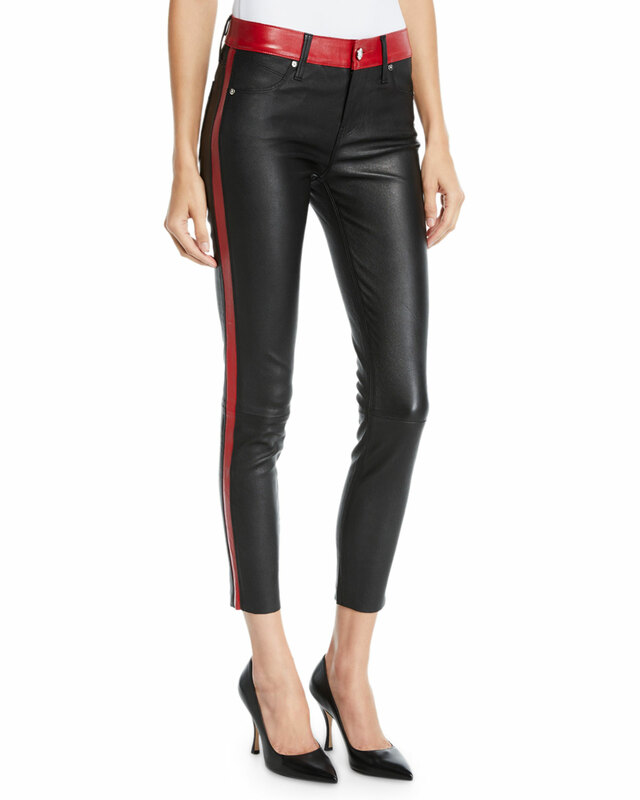 RtA Ryland Two-Tone Leather Legging. $1,095. 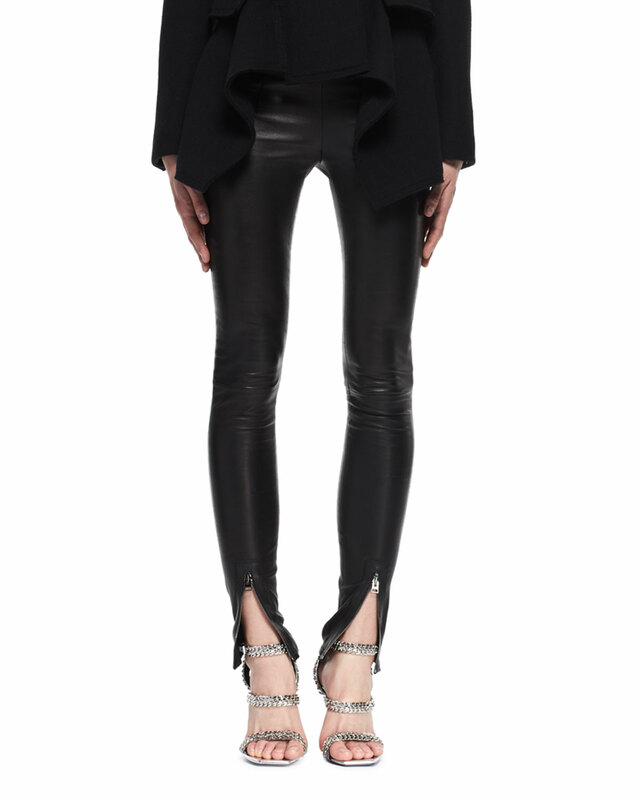 TOM FORD Leather Zip-Cuff Legging.$2,490. 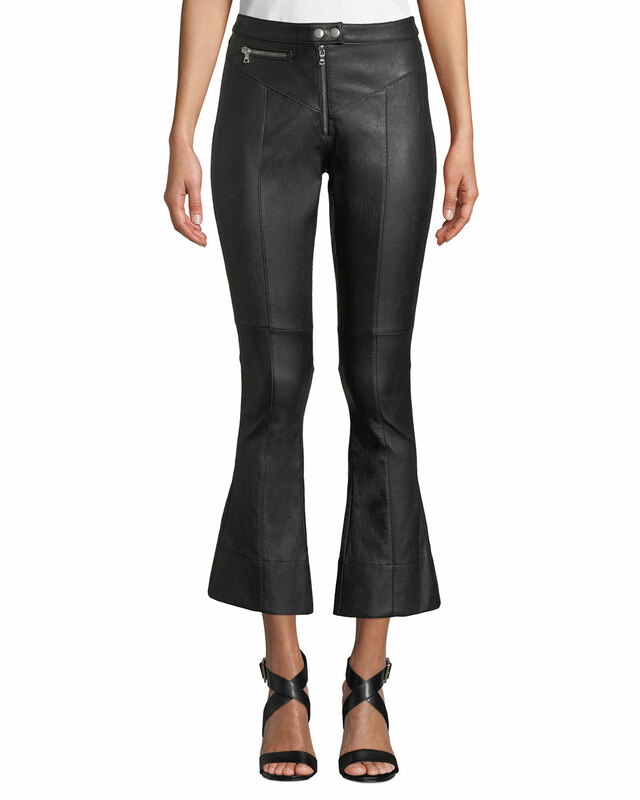 UNRAVEL Leather Up Flare Pant. $2,120. If you, like me, shun the sun in favor of a healthy, wrinkle-free epidermis but still love the look of sun-kissed skin, consider VITA LIBERATA Luxury Tan Tanning Lotion. This faux tan is amazeballs. It is probably the closest thing to a real tan that I’ve found and I’ve tried them all. VITA LIBERATA Luxury Tan. $30.00 www.dermstore.com. For the application: Be sure you use either the brand’s own separately purchased application mitt or those disposable food preparation gloves you can buy from any drugstore–the ones that come like a 100 to a box. I use the latter because I’m frugal and I don’t like having a stained mitt lying around the bathroom. The plastic gloves work great, and you can just toss them when you’re done. This brand is really high quality and if you apply the lotion correctly and carefully, it looks incredibly natural. No one will know if your glow is real or faux. Word of caution though. I went to bed with the lotion on and my white sheets now have a yellowish hue. I’m pretty sure it will wash out but you might want to shower before going to bed on days you apply the tanner. Leopard spots are all the rage this season and are fast becoming a classic. If you have yet to get spotted, consider this chic leopard-themed blouse from Zara. Pair it with slim black trousers and leopard print booties for a double dose of fun. So chic, you will be able to wear this little number for years to come. Animal print blouse. $39.90. http://www.zara.com. I love functional clothing. You could argue that all clothing is functional, serving to shelter our bodies from the elements, etc. But, I believe some pieces are more functional/versatile than others. 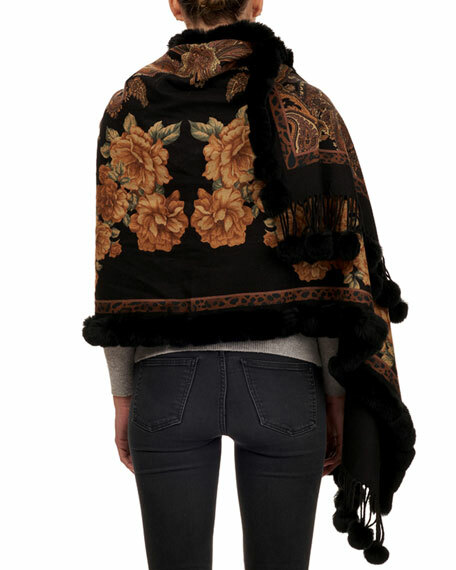 Case in point–the shawl. 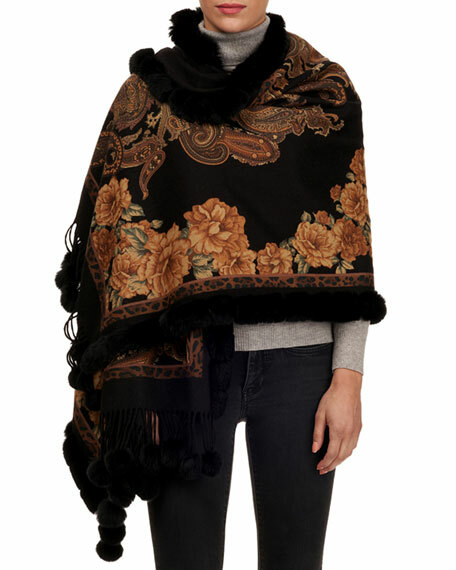 Not only does a beautiful shawl have the power to add a certain je ne sais quoi to an outfit, it also imparts a layer of warmth on chilly fall nights when you need a soupcon of coverage as opposed to the whole shebang of a coat. I also believe that most of us would get a lot more wear out of a wrap than a full-length fur coat. 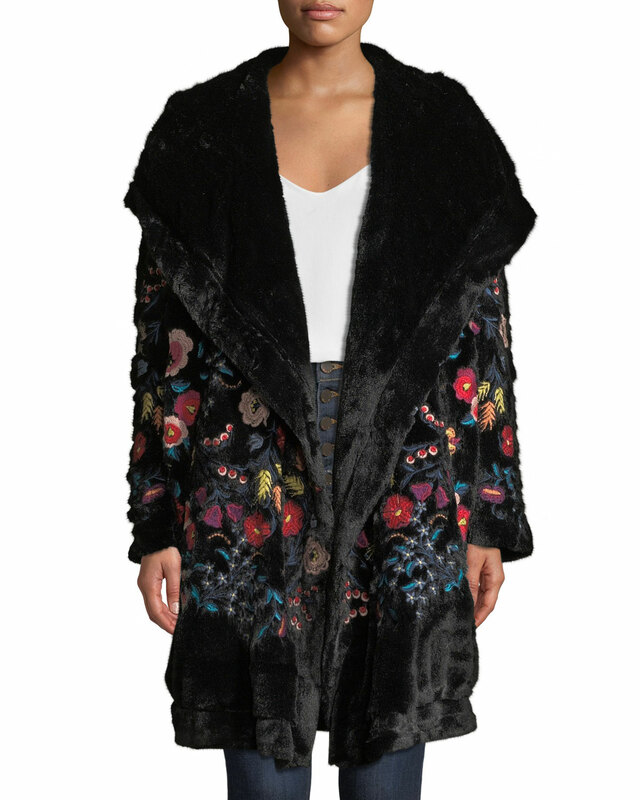 Don’t get me started on global warming…But really, I see this type of wrap as my generation’s version of the mink coat. It’s less in your face and a whole lot more practical…unless you live full-time in the North Pole. If you love the idea of a shawl as much as I do, check out some of the coolest (no pun intended) ones currently in stores. 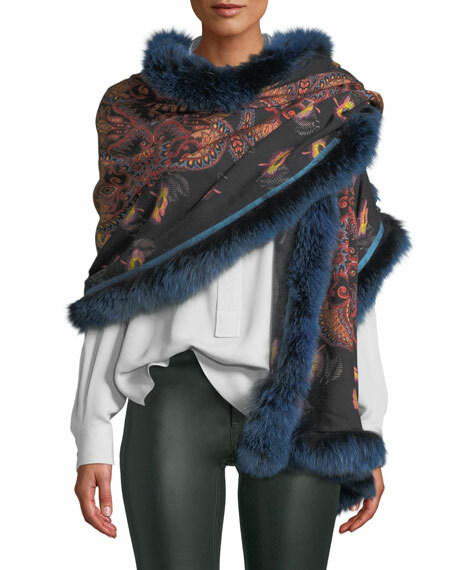 With its blue fox fur trim and soft cashmere paisley print, the Shaal-Nur Shawl from Etro is a showstopper, an all-eyes-on-me kind of wrap. It reminds me of something one would wear when visiting a storied locale like Moscow. Can’t you picture yourself in it among all those beautiful buildings with their Christmas ornament tops? Wear with leather leggings, as shown here, or with jeans. Dress it up or down. Either way, you’ll stand out. $1,700. http://www.neimanmarcus.com. Oscar de la Renta’s Dyed Silver Fox Fur Stole comes in a rich emerald green and is lined in silk. $3,950. http://www.neimanmarcus.com. 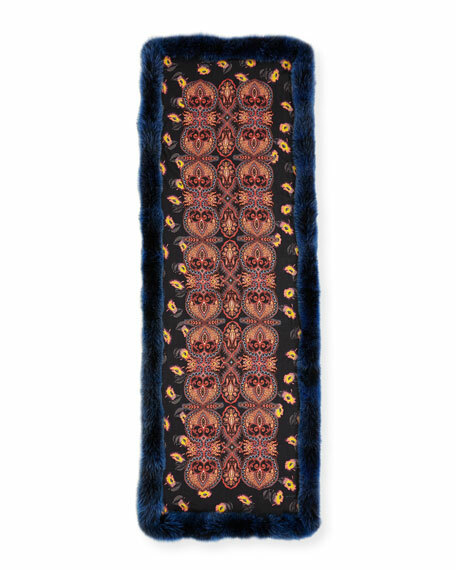 The Sofia Cashmere Shawl features floral embroidery and dyed fox fur trim. $1,395. http://www.neimanmarcus.com. 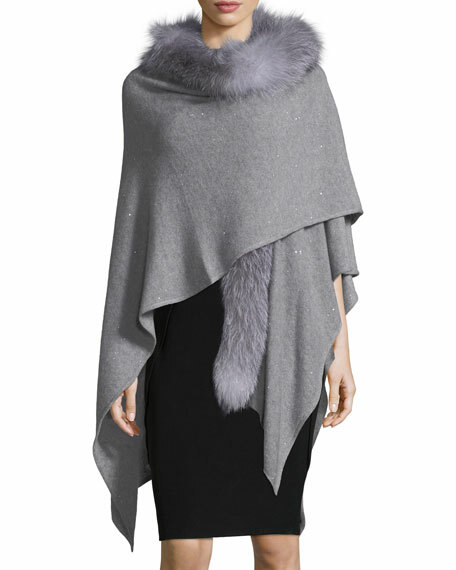 Also from Sofia, this cashmere blend wrap boasts sequins and a fox fur trim. $1,495. http://www.neimanmarcus.com. 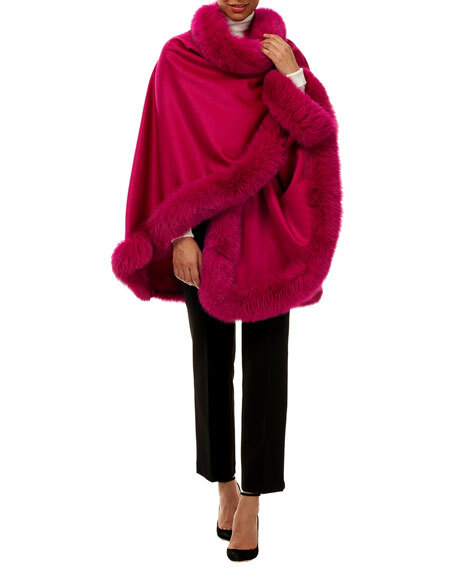 Gorski’s Cashmere Cape with Fur Trim comes in an array of colors, including magenta. $1,895. http://www.neimanmarcus.com. Paisley and Floral Cashmere Stole from Gorski. Love the elegant pompoms. $995. http://www.neimanmarcus.com. 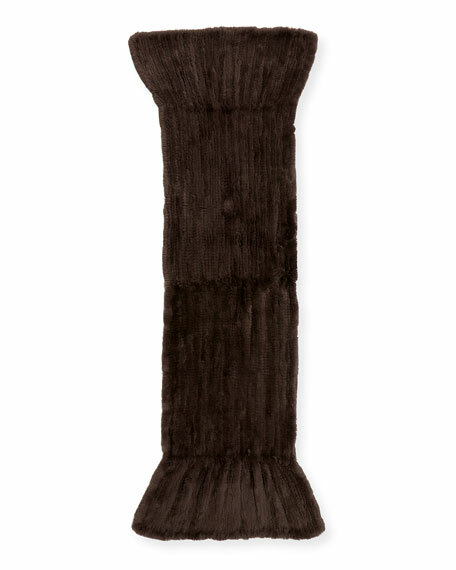 Another stole from Gorski–this black fur-trim wool stole sells for $695. http://www.neimanmarcus.com. 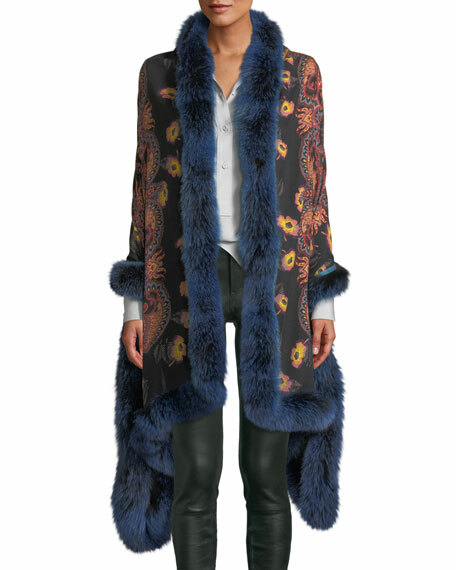 Halston Heritage’s Rabbit Fur Stole is convertible. It can be worn as a sweater, scarf, or shawl, or off the shoulders. $795. http://www.neimanmarcus.com. When I was recently in Las Vegas, shopping at the Forum in Caesar’s Palace, I found myself somewhat smitten with the window display at ALLSAINTS…the same window display featured in today’s photo. What I loved most was the look of buckled ankle boots paired with a dress. But I have to confess, it was really the boots that made the greatest impression. I keep thinking about them. Today’s post is dedicated to those buckled boots: one reasonably priced pair–the ones from ALLSAINTS–and one ultra luxe pair by Chloe. Both have the same cool buckled aesthetic, medium-high heel, and pointed toe. Same look. Different price points. Both equally cool. 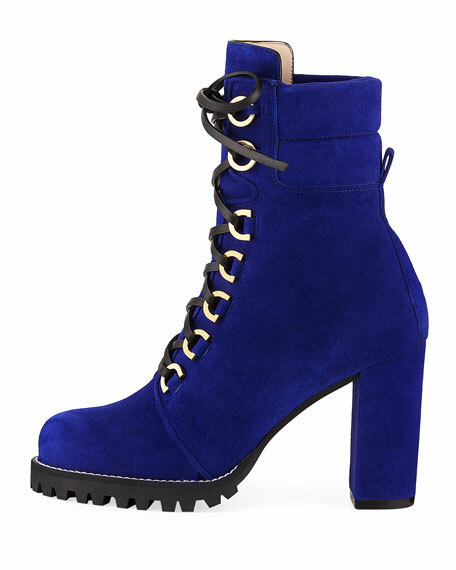 I’d wear them with black cropped flare jeans, a midi-length dress, leggings with a long, over-sized sweater, and more. Highly versatile, these puppies will take you from fall into winter. 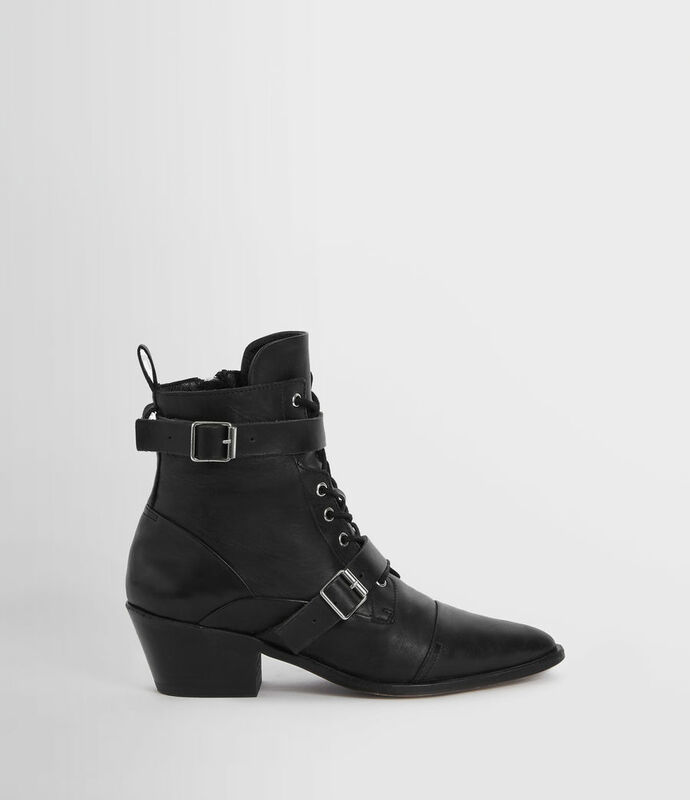 ALL SAINTS’ Lucie Boot. $348. http://www.us.allsaints.com. 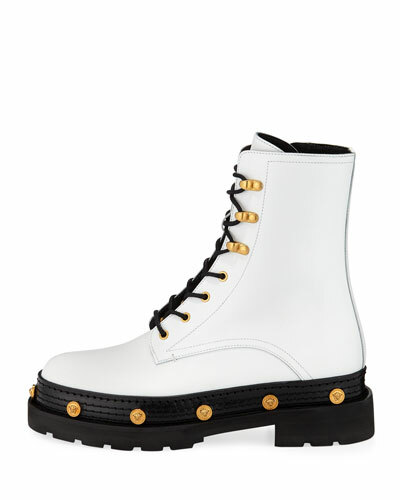 Chloe’s Rylee Boot is shinier, but it’s also a whole lot pricier at $1,390.00. This boot also comes in white. http://www.neimanmarcus.com. Marie Antoinette is famous for her supposed decadence. Before she was subjected to the guillotine on October 16, 1793 (9 months after her husband, King Louis XVI of France), she was accused of being frivolous, lavish, and immoral. While she was no angel, much of the disparaging stories written about her are untrue. For example, she never said, “Let them eat cake.” What she did do, however, was coat her elaborate wigs in flour while many of the French people were starving from lack of bread. One of the more interesting tidbits about Marie Antoinette and the Royal Court at the time has to do with their shoes. Versailles, back in the day, was a filthy lodge, brimming with animals and excrement. Instead of cleaning their shoes and re-wearing them, aristocrats would simply throw them out every couple of days. Marie Antoinette’s brother-in-law, Le Comte d’Artois, ordered 365 sets of shoes every year and simply wore a fresh pair each day. His clothing expenditures far outpaced those of the queen. 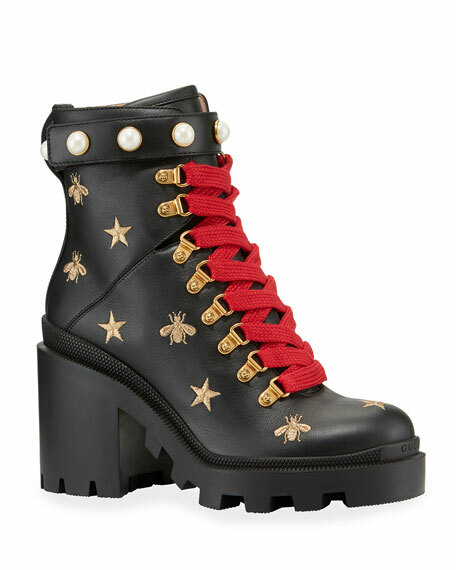 In memory of misunderstood Marie Antoinette, I offer a smattering of combat boots fit for a queen who had to walk through a lot of … well, gunk. These boots elevate the style to all new levels. Take a look. 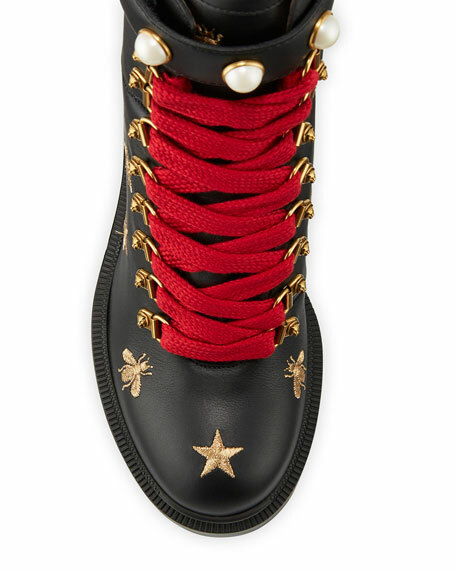 Versace Medusa Medallion Boots. 1,595.00. http://www.neimanmarcus.com. 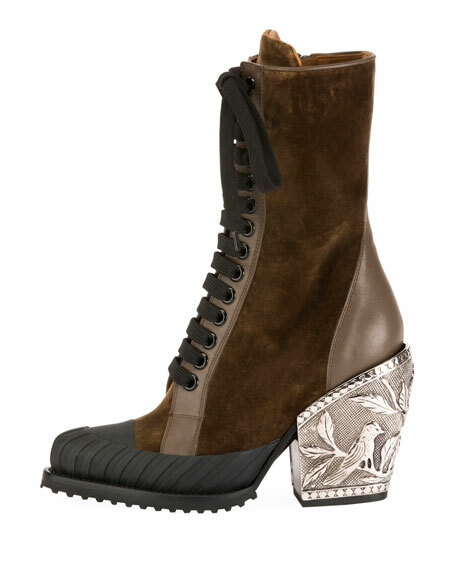 Gucci Embroidered Platform Hiking Boot. $1290. http://www.neimanmarcus.com. 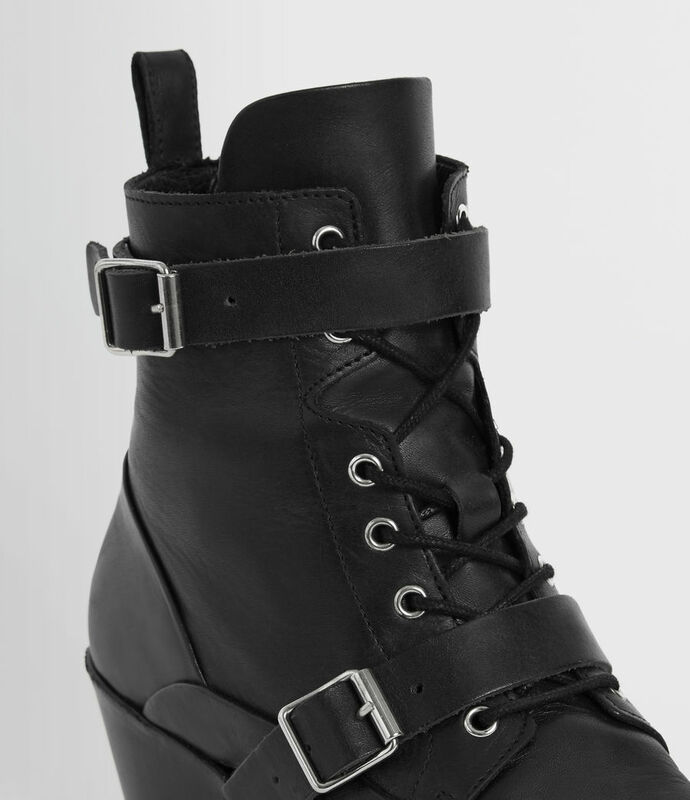 Balmain Calamity Cap-Toe Boot. $1750. http://www.neimanmarcus.com. 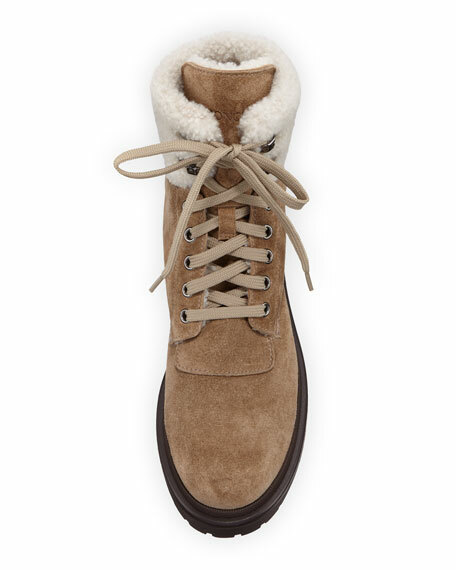 Moncler’s Patty Lace-Up Suede Boots. $795. 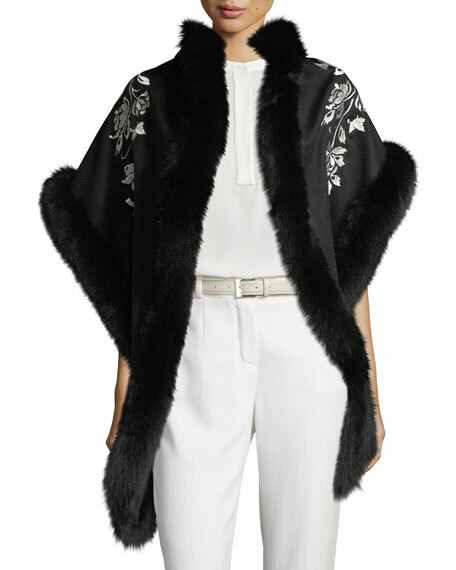 http://www.neiman.marcus.com. Chloe Rylee Boots. $2340. http://www.neimanmarcus.com. 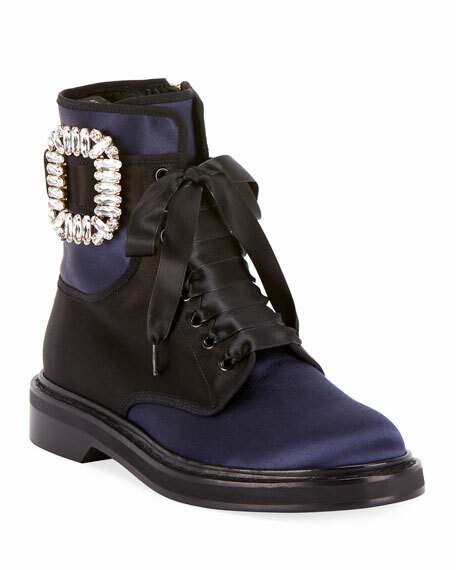 Roger Vivier Viv Rangers Strass Boots. $1875. http://www.neimanmarcus.com. Chloe Rylee Boots. $1390. http://www.neimanmarcus.com. 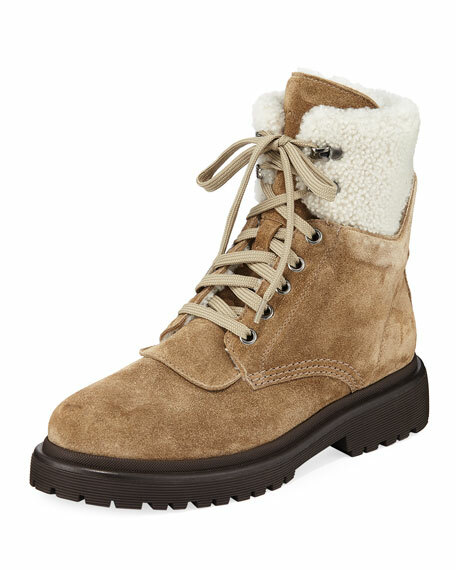 Stuart Weiztman Shackelton Suede Boots. $698. http://www.neimanmarcus.com. When I was around eight years old, my parents bought me a little girl-sized fringed suede bag. It was a rich hue of butterscotch, and I could wear it across my body. I loved that bag. Where I went, it went. I wore it so much that one of my friends–a girl named Ginger–harassed me at school each day, begging me to give it to her. Not wanting to part with my beloved purse but also reticent to say no to this particular chickadee, I went home and took a Sharpie and wrote my initials all over my beautiful bag. Basically I destroyed it…but also made it much less appealing to Ginger, whose initials were totally different from mine. Part ingenuity, part stupidity, part lack of courage. Fast-forward to today, and I remain enamored of all things fringed–fringed purses, leather jackets with fringed sleeves, boots embellished with artful shards of leather. By the way, I have finally learned how to say no when I need to. It’s still hard, but, over time, I have honed that voice–the one who speaks up for herself when necessary. Because it’s a bold look, I wear fringes sparingly. 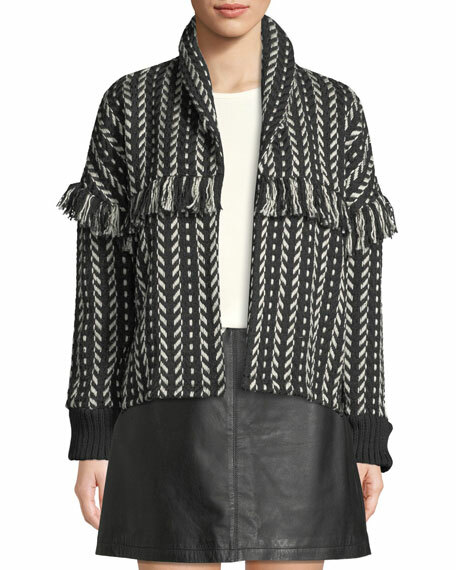 I would never recommend wearing a fringed purse while also sporting a fringed jacket and fringed boots. That’s just way too much going on, and I fear I’d be lost among the raw edges. Worn as one accent piece, however, fringed elements conjure a sense of the Wild West, Native American culture, and the desert. It can be a very sophisticated aesthetic when done right. Here are some of my favorite fringed wares currently available in stores. Boots in featured image: Izabel Domed Feather Booties with Chain-Shape Heel by Balmain. $2650.00. http://www.neimanmarcus.com. Tory Burch Farrah Crossbody Bag in Navy Suede. $278.00. http://www.neimanmarcus.com. Cupcakes and Cashmere’s fringed jacket. $135.00. http://www.neimanmarcus.com. 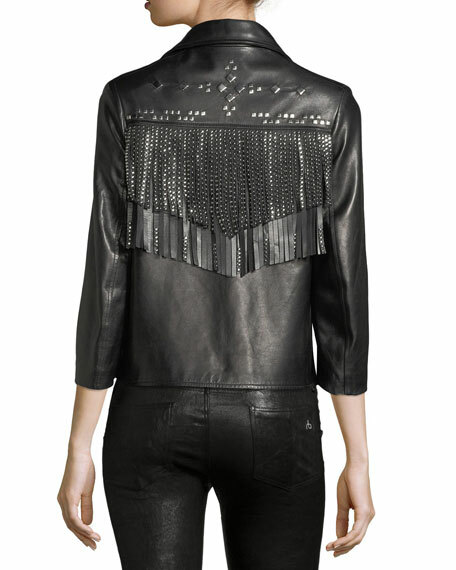 Nour Nammour Leather Jacket. $1760.00. http://www.neimanmarcus.com. Givenchy’s Antigona Suede Satchel. $2990.00. http://www.neimanmarcus.com. Nour Hammour Leather Jacket. $2685.00. http://www.neimanmarcus.com. Here is a similar denim fringed jacket for a fraction of the price. $69.90. http://www.zara.com. Fringed leather crossbody. $49.99. http://www.zara.com. Boots with fringed tassels. $199.00. http://www.zara.com. 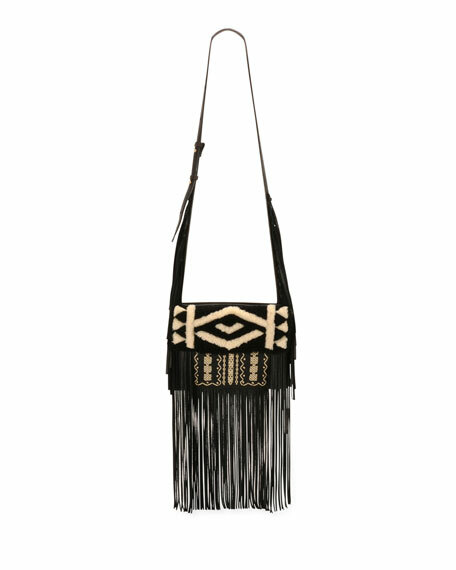 Givenchy Triple Fringe Crossbody. $1390.00. http://www.neiman.marcus.com. Fringed gray jacket. $69.90. http://www.zara.com. 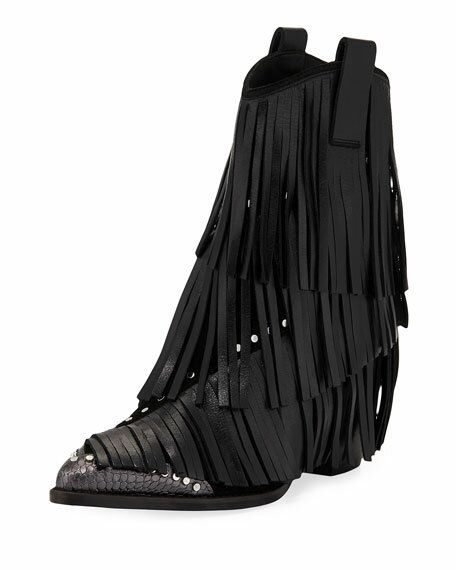 Fringed boots by Zadig & Voltaire. $528.00. http://www.neimanmarcus.com. Etro Embroidered Deerskin Fringe Crossbody Purse. $2505.00. http://www.neimanmarcus.com. Fringed faux suede jacket. On sale for $25.99. http://www.zara.com. 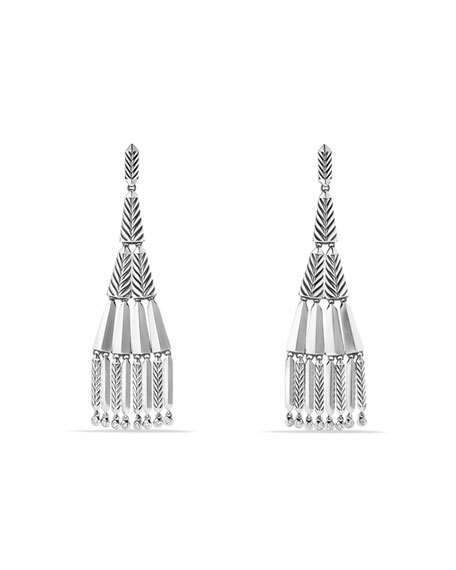 David Yurman Earrings. $2800.00. http://www.neimanmarcus.com. 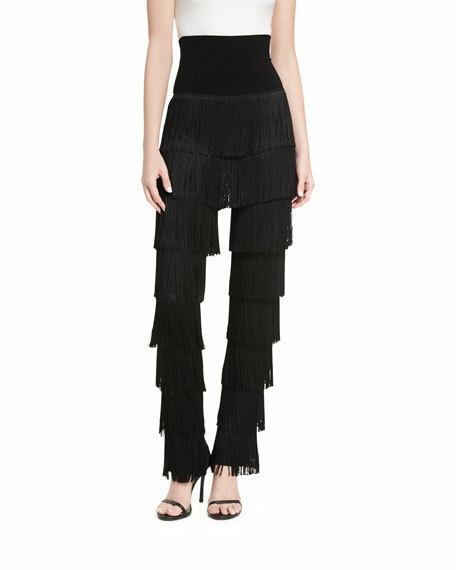 Fringed bootcut pants by Norma Kamali. $695.00. http://www.neimanmarcus.com. 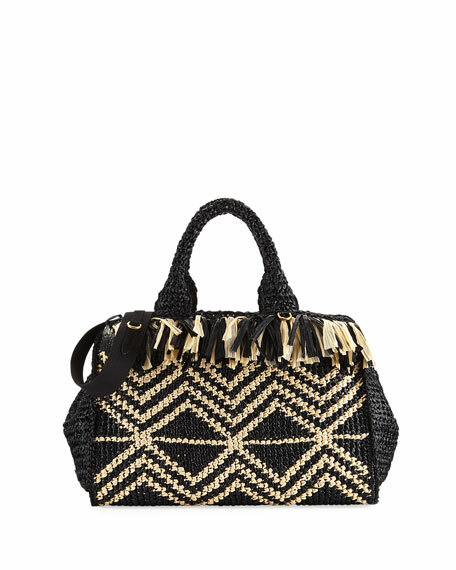 Prada Large Raffia Bag. $1850.00. http://www.neimanmarcus.com.